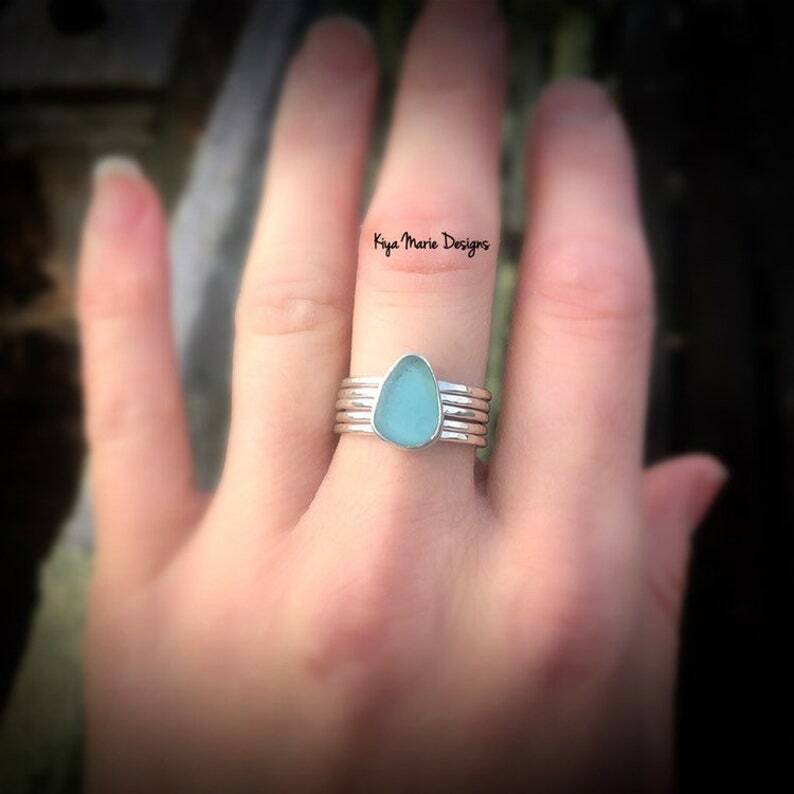 Gorgeous and sparkling custom sea glass stacker ring set! The base price includes one sea glass ring in your choice of color* & ONE hammered stacker ring. Each additional stacker ring is available at my wholesale price of $6. To get the look pictured, you would purchase 3 additional stacking rings when checking out. The sea glass is bezeled in Argentium silver and soldered to a hand forged hammered Argentium band. All additional stackers are Argentium Silver and hammered by hand to a shiny, ocean-wave texture. Please include your size and color choice in a note when checking out. *Color choices are: aqua (shown in photos), lime green, cobalt blue, light amethyst purple, brown, and Kelly green. Rarer colors (such as red) are an additional charge, please convo me if you are looking for a different color. Please note that shades may vary, for example, a given aqua may be lighter shade than the one pictured. See color differences between two aquas in photos - I will always send a photo of the glass I pick for your ring for your approval. Copyright © 2015-2019 Brittany Russo, Kiya Marie Designs. I reserve all reproduction rights. No work may be reproduced in any manner, or derivative copy made. Love. The color and setting of the sea glass.